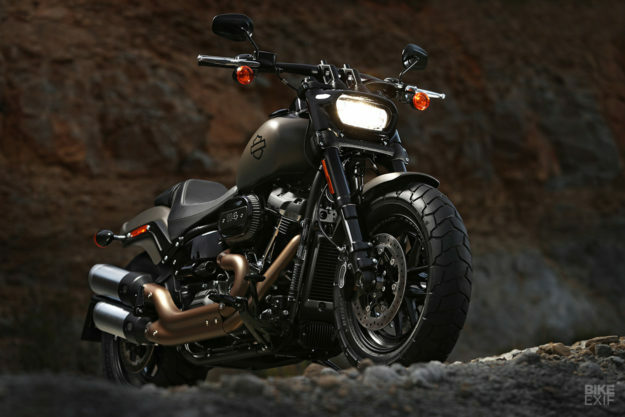 WHEN HARLEY-DAVIDSON ANNOUNCED its new Softail range, Dyna fans wept and shook their fists. 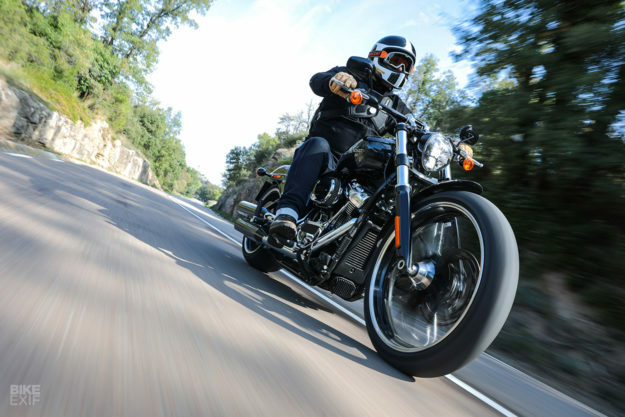 Their beloved twin-shock platform was gone, with existing Dyna models absorbed into the eight-strong Softail model line-up.It’s understandable—the Dyna was the go-to performance Harley for many riders. 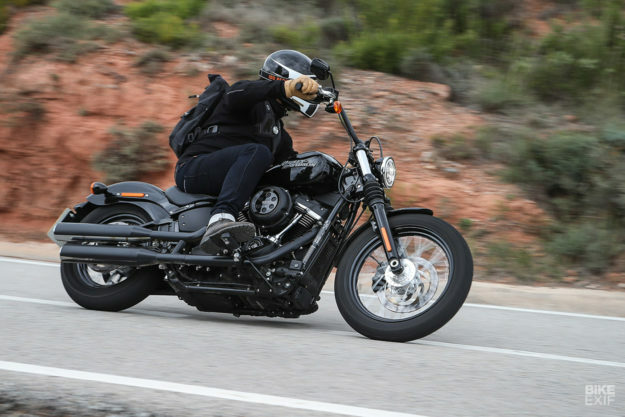 But if the new Softail rides better than the old Dyna, does it matter? To find out, I headed to Cataluña in the east of Spain, to sample the new range. So how did the Motor Co. pull it off? Basically they’ve built an entirely new motorcycle—with a stiffer chassis and a better engine—and then morphed it into eight different variants. In ascending order of price, these are the Street Bob, Low Rider, Softail Slim, Fat Bob, Deluxe, Fat Boy, Heritage Classic and BreakoutThe goal was to mesh all the classic appeal of the Softail with the performance aspect of the Dyna—but make it better than both in every way, with less weight, better handling and more power. It’s Harley’s largest product development project to date, and I have a fat PR pack in front of me explaining every little detail. But I’m going condense it down to the two most important bits: the chassis and the motor. 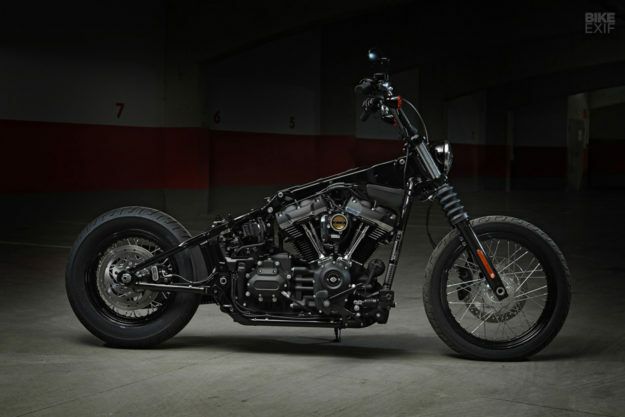 With its clothes off, the new Softail is a work of art. (See Street Bob, above and below.) It has the same faux hardtail layout as its predecessor, but with a conventional shock rather than the previous push/pull system. The geometry’s been revised too, but more importantly the frame is 65% stiffer than before, making the overall chassis 34% stiffer. 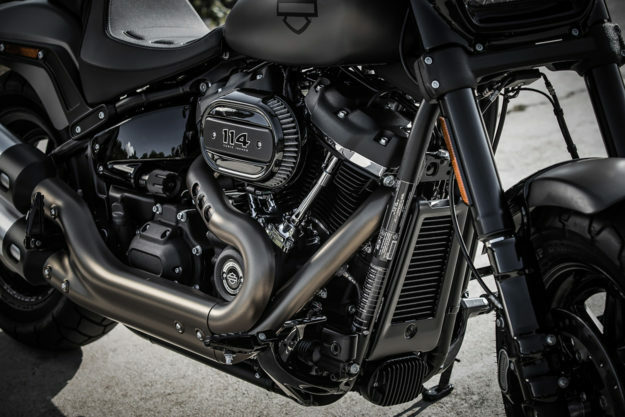 Weight reductions vary, with some models shedding as much as 35 lbs.Harley use two different swing arms—one for wide and one for narrower tires—and three different steering neck angles to tweak each model’s individual setup. The suspension is all-new too; the rear shock is adjustable for preload, and the front forks feature a ‘dual-bending’ valve system for a more responsive feel. Powering the new Softail is Harley’s stellar Milwaukee-Eight power plant, available in two variants: 107 ci (1,746 cc) and 114 ci (1,868 cc). It’s a thing of beauty, and it’s a total gem to ride too. 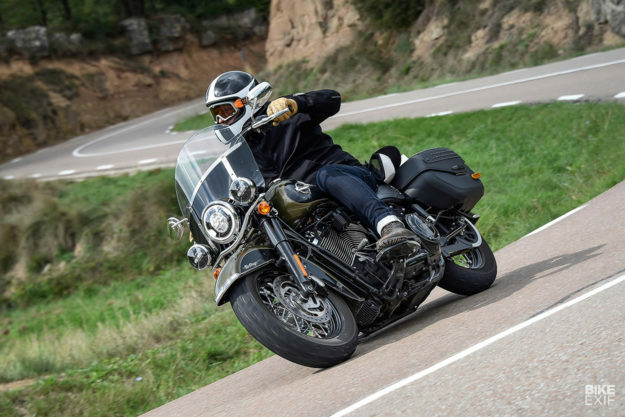 That’s not just the PR talking: I sampled it on last year’s touring models.Each model comes standard with the 107 mill, but you can also get the Fat Boy, Heritage Classic, Breakout and Fat Bob as 114s, each with a high-flow air filter. 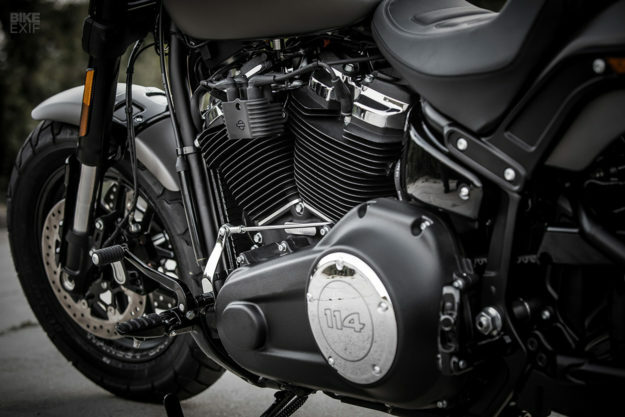 The 45-degree V-twin’s biggest strength is that it delivers power smoother than you’d expect from a big American cruiser, without sacrificing an ounce of character. That smoothness is down to a dual counter-balancer, which also means that the engine can now hang off rigid (rather than rubber) mounts. This makes it a stressed member, adding to the overall flex resistance.Jumping from the previous ‘high output’ 103 twin cam to the Milwaukee-Eight has also resulted in whopping torque gains. 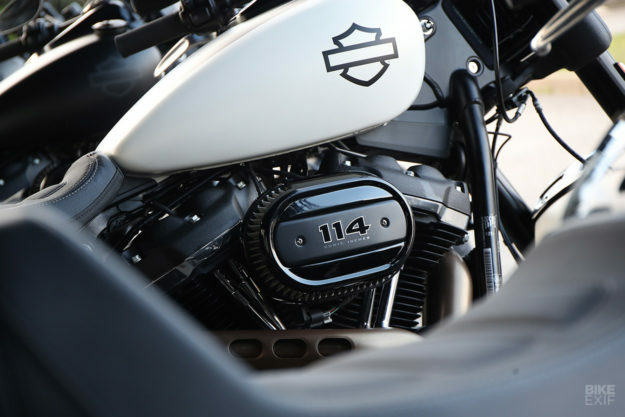 Harley claims that the 107 has 145 Nm and accelerates 10% quicker than the 103. The 114 has 155 Nm, and is 9% quicker still than the 107. Other new features include Daymaker LED headlights all round, new instruments, and a wet sump that sits lower (the old oil tank had to make way for the under-seat shock). There are also some nice ‘shortcut’ features for customizers, like rear struts that can be unbolted, and a two-part clutch cable.I was itching to see if all this hard work has paid off—especially since Harley picked an unforgiving proving ground for the launch. We’d be riding four models over two days, over some of the twistiest mountain roads in Spain. I’ll dig into the details of each bike in a minute, but they all share some pretty universal traits.For starters, I have to give H-D ten out of ten for build quality and final finish. The paint on each model is deep and flawless, thanks to some pretty rigorous QA processes. Engine and chassis parts sport finishes as diverse as wrinkle black and brushed chrome from model to model, and not a single item looks out of place. But how do they ride? Paul James, product portfolio manager for the Motor Co., told me he hoped people wouldn’t say that the Softail performs well “for a Harley,” but that its performance would truly impress them. Well, it did truly impress me. And every other guy I rode with.If I’m honest, percentages of rigidity and performance increases go over my head—I just want a bike that feels good. The old Softail felt vague and spongy in corners, and the Dyna would flex if you pushed it too hard. 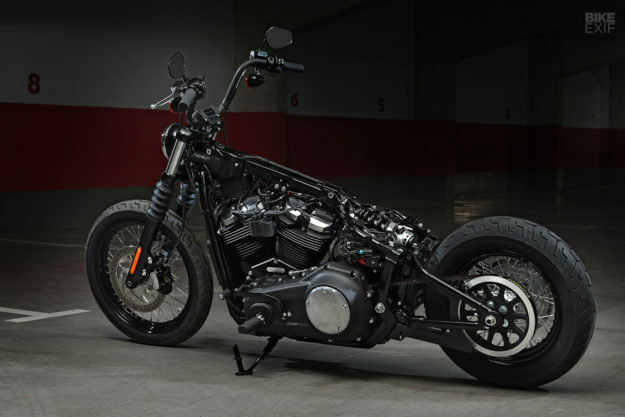 But the new Softail is surprisingly agile—able to pitch into a corner, hold its line and fire out the other side. Yes, it’s still a cruiser, so ‘agile’ is relative. And even though each model has improved ground clearance, you’re still eventually going to scrape pegs, footboards and sometimes exhausts. If you’re looking to get a knee down, you’re obviously barking up the wrong tree. But we were riding on tighter and curvier roads than most customers will, at a pace that most customers won’t. And we were all loving it.The 114 Milwaukee-Eight motor is truly monstrous, and the 107 isn’t far behind. And while big twins are all about torque, both love to be revved, with a slick and predictable throttle and fuelling feel. There’s also just enough of a vibe to stay true to that classic Harley feel, but not so much that I got off with numb hands or missing bolts at the end of the day (it’s happened to me before on the Dyna). The six-speed box and torque-assist clutch shift easily enough, and I could actually find neutral, which was refreshing.The brakes and suspension also impressed throughout the range. I seldom touched the rear brake (mostly because on some models I found the lever to be a little hard to reach, and didn’t have time to adjust it), and a couple of fingers on the front was usually enough to slow the bike down. 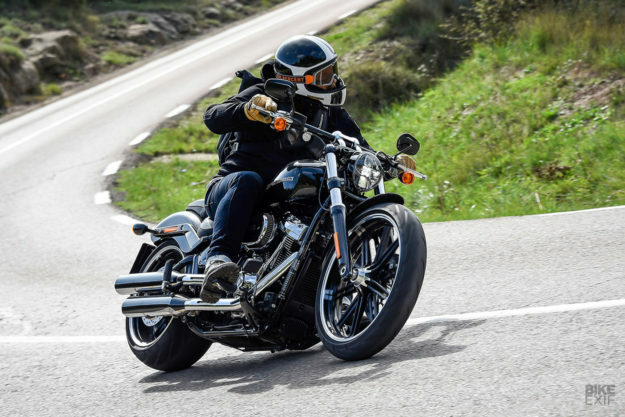 I mentioned the lack of fork adjustment to Harley’s people, and their reasoning was twofold: they reckon most customers won’t spend time on suspension setup, and the new forks perform well enough not to need it. I can see the logic in the first statement, and after spending miles riding these bikes harder than I should have, I walked away convinced. So how did each individual model do? I’ll break down the key features of each, then what it was like on the road. Heritage Classic 114 A traditional cruiser with saddlebags and a screen, the Softail Heritage Classic is the least relevant bike on this list. But that doesn’t mean it isn’t a sweet ride—and a good-looking one too, if that old school, big fender vibe is your thing.Mine had a lush olive green paint job, surprisingly little chrome, and a mostly blacked-out motor. 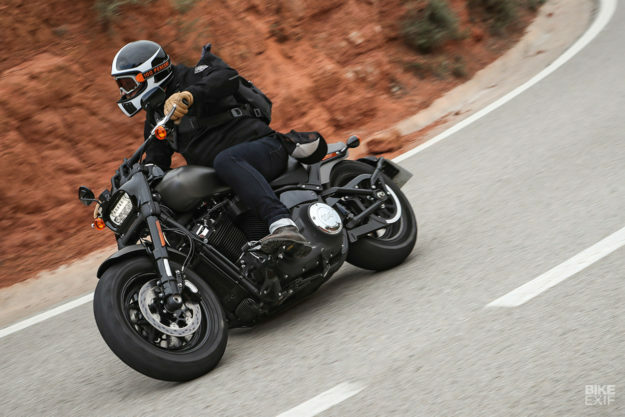 It’s not the sort of bike you’d really customize outside of H-D’s own catalog, but it does feature upgrades like rigid, locking saddlebags, and cruise control. And I have to admit that the new LED lights—and the slick new analog-digital combo dial—are really well executed.Out on the road, it shunts way quicker than grandpa’s Softail. As laid-back as it looks, it loves to rail turns and scrape floorboards. Sure, I’ll never dream of owning one… but if my retired Harley-loving parents upgrade this year, you can bet I’ll ‘borrow’ it. Breakout 114 The new Breakout maintains the raked-out drag bike look that made the outgoing model so popular, but in a more modern package. The tank has a low profile from the side, and a killer outline when you’re looking down at it, with sharp corners up front and a taper towards the rider.H-D were clear that the new Softails should retain as much classic Harley DNA as possible, but still move forward, and the Breakout’s running gear is the epitome of this. 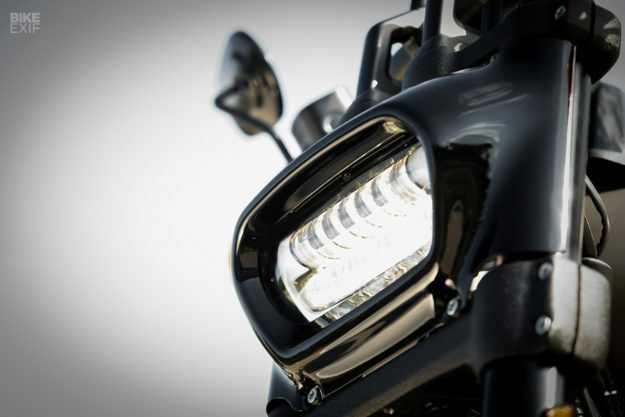 The oval LED headlight is inspired by the Livewire, and instead of a traditional speedo, there’s a narrow little digital dash integrated into the top handlebar clamp. Riding the Breakout is a little weird. For boulevard posing it’s a dream, but with a skinny 21” front wheel and a whopping 240 mm 18” rear, pitching it through turns takes some getting used to. The front finds its line quick, but the rear takes a second to catch up.It took a few corners to familiarize myself. But once I had the method down I was scraping the forward pegs, occasionally bouncing the exhaust’s heat shield off the black top, and literally laughing into my helmet. Street Bob Harley-Davidson clearly didn’t want to spoil us too much, so they slipped at least one 107 into the set: the Softail Street Bob. 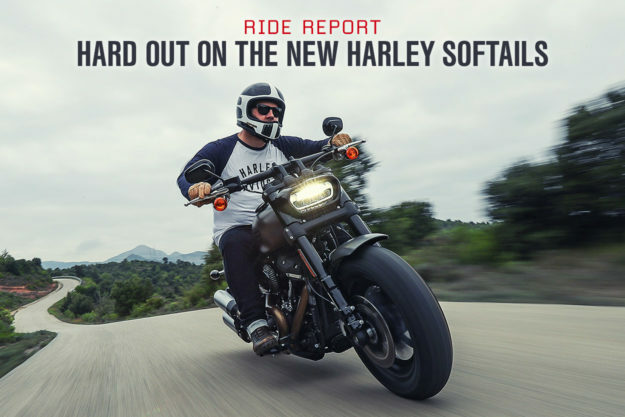 As the cheapest new Softail, it’s the most likely entry point into the new range, and a logical step up for Sportster owners looking to upgrade.Out the box you get a solo seat, mini ape bars and mid-mounted foot controls. The riding position is frankly bizarre and uncomfortable, but it’s also awkward in a way that makes you feel really cool riding it. I’m six foot tall, so a cruiser with a low seat height and mid pegs normally doesn’t cut it for me. Most guys my height are going to fit forward pegs and adjust the bars right away. That’s also the Street Bob’s strength. It’s a blank canvas, and the Softail that’s probably going to get the most love from customizers. Plus there’s almost zero chrome on it, and it’s kitted with the same sweet little mini-speedo as the Breakout (finished in black).It’s the lightest of the new range too, which—combined with its narrow 19F/17R wheel sizes—makes it the most flickable, and a total hoot to ride with those mini apes. Given the option, I’d be hard-pressed to choose between this guy, and the next one on the list. Fat Bob 114 The bike that grabbed the most attention when the range was announced, the Fat Bob 114 is a muscle bike of the highest order. I’m a huge fan of the 2017 Dyna Low Rider S, and as far as I’m concerned, this is the replacement.Let’s start with the obvious: the Fat Bob’s punch-in-the-face looks. If you think it’s weird and awkward, I’d like to direct you to the outgoing Fat Bob. Satisfied? There’s not an angle on this bike that I don’t love. The pillbox LED headlight is killer, and so is the raised rear fender, the massive double barrel exhaust system, and the cast wheels. I normally detest drag bars on bike, but these drag bars start wide and taper down to 1”, held in place by beefy cutaway risers that tilt them closer to the rider. My only gripe is the speedo. I love the analog and digital mash-up, and there’s plenty of information to keep you happy. But I was left pining for the same handlebar-mounted mini-dash as the Street Bob and Breakout.Looking down at the tank to check speed on a monster motorcycle is less than ideal. (I asked, and swapping the speedo out isn’t possible without serious modifications). Hooning on the Fat Bob was an epic experience. 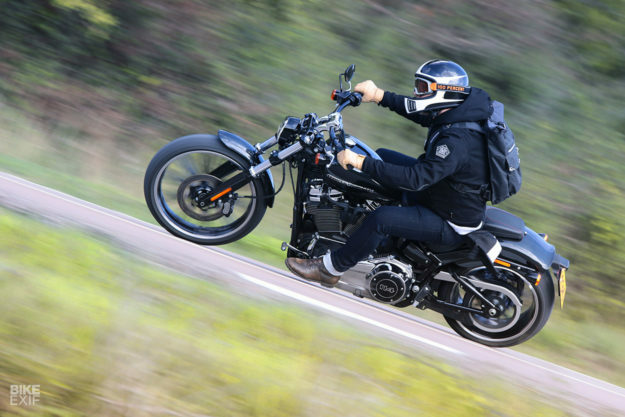 Harley’s Paul James hopes that this is the bike that will attract sporty riders who are fed up with pukka sportbikes, and he might just be right. It shouldn’t love corners because it’s 676 pounds (306 kg) wet. And it has 16” wheels measuring 150 mm wide up front and 180 mm at the rear. But it does love those corners—provided you’re willing to work for it.You know how on some rides you just feel a bit off? That was me, the day I hopped on the Fat Bob. But once I’d figured it out I started finding my groove—just in time to swap bikes, sadly. The trick is to counter steer, get your head and shoulders over, and muscle it through. It is hard work. It is tiring. 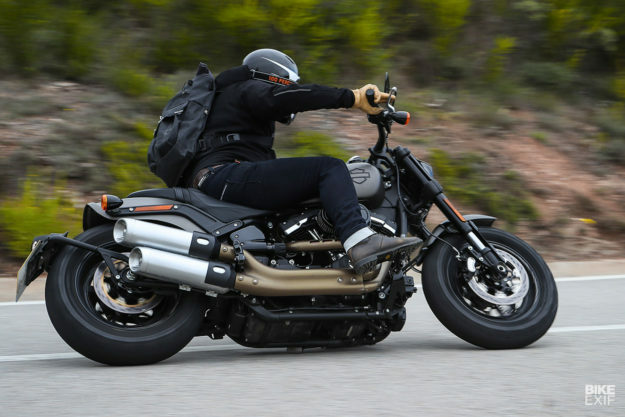 But it’s bags of fun, and I’m aching for another go on a better day.The Fat Bob is also blessed with the most ground clearance of the range, thick inverted forks offering even more performance, and pegs that are more mid-forward than fully forward. The biggest surprise? It was hands-down the most comfortable of the four. So why are we talking about Softails, when there are more custom Sportsters on these pages than Softails and Dynas combined? It’s pretty simple. 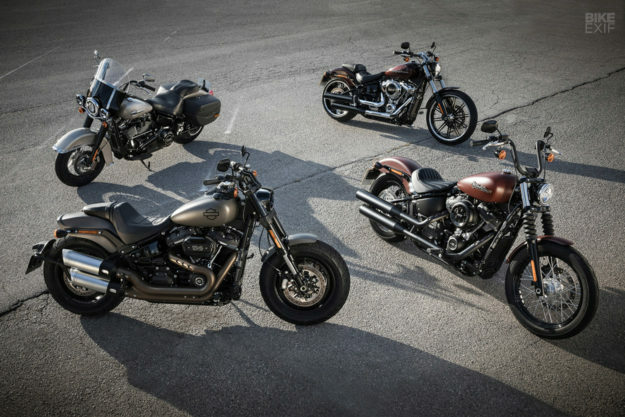 Harley-Davidson have said that they’re releasing 100 new models in ten years.That’s a bold statement, and judging by just how different these new bikes are to their predecessors, they’re taking it pretty seriously. It also has us thinking about the venerable Sportster. At 60 years old it’s long overdue for a major overhaul. 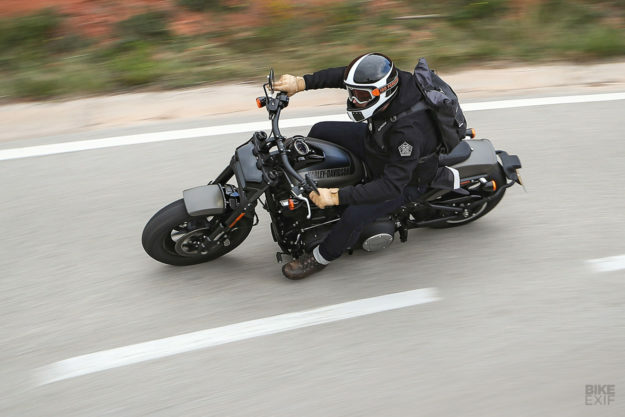 If the Motor Co. was willing to kill off a bike as loved as the Dyna, is it that much of a stretch to imagine a modernized Sportster that lives up to its name? While riding a motorbike, you must remember to wear the right safety gear and accessories. A motorcycle leather jacket is supposed to be one of the most essential and preferred accessories. Apart from making you look good, it provides safety and protection. Nothing could ever match the style and convenience of a leather biker’s jacket. Does the leather jacket give you a macho look? Yes, of course, it does. The quintessential black biker’s leather jacket is all about attitude and it is nothing but masculinity personified and glorified. It has been worn by tough guys since time immemorial. It easily imparts the tough, rugged image and certainly the macho look. Why is it essential to wear a leather motorcycle jacket? A motorcycle leather jacket provides ample protection and is an integral part of the safety gear of a motorcyclist. Riding a motorbike with the wrong clothes could prove to be dangerous in the event of a crash. You certainly need a sturdy leather jacket to protect you from serious injuries, bruises and scrapes if you are involved in a bad fall or any accident. A biker’s jacket is well-padded at the right places and it boasts of the perfect features for cushioning your body in the event of a fall or an accident. It provides exceptional abrasion resistance. Does your motorcycle jacket protect you from the harsh weather conditions? Yes, 100 percent. A leather motorcycle jacket has been designed in such a manner that it offers complete protection while you are riding on the road from the harsh weather conditions. If you are constantly on the move, your leather jacket would provide you the required protection. It is great at protecting you from the rain, the snow etc. It is your best friend on a frosty night in winter or a wet rainy day. No other jacket could match it in terms of safety, and convenience. It has been specially designed and crafted for excellent weather protection. Will colourful leather jackets make you more visible? Today leather jackets are available in many bold reflective colours apart from the quintessential and the hot favourite black motorcycle leather jackets. You may buy black leather jackets with white or orange or any other contrasting colour panelling. Motorcycle jackets come in dark and reflective colours to draw other motorists’ attention and be visible while riding. What to look for in a leather biker’s jacket? There is a lot to learn once you start your journey in the world of motorbikes. There are so many things to get for enhancing the overall motorcycling experience. You need to be fully aware of all the safety rules and safety gear if you wish to get the most of the motorcycling experience. Riding a motorcycle is not without hazards so you need to know the safety rules of the game to stay well-protected. 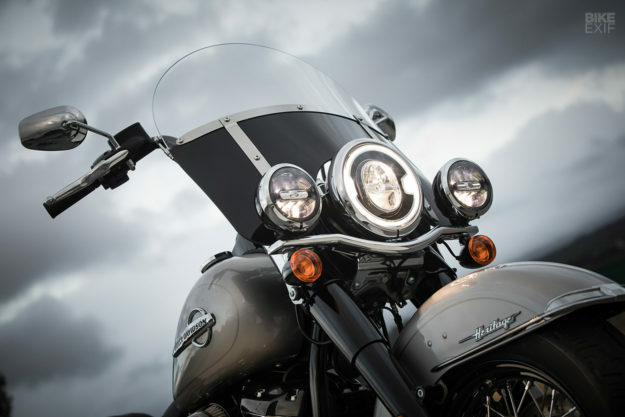 What are the safety rules of riding on the road? You must focus on safety and always obey the safety rules while motorcycling on the road. Obey traffic signals, laws and signs. Wear the right safety gear especially, the helmet, motorbike pants, jackets etc. each and every time you are riding and be a legally compliant motorcycle rider. You must be predictable on the road so that other riders, drivers, and pedestrians are able to predict your movements. You must be alert at all times. Always learn to expect the unanticipated and ride defensively. Keep track of what is happening around you. Never change lanes without checking behind you. Regular maintenance of your motorcycle is a must. You should have a front bike light and a rear reflector both in working condition at all times. You must carry the right tools for fixing issues including a flat tyre. Wear brightly coloured or reflective outfits to be visible even at night. How could you be a courteous rider? You could be a courteous rider by yielding to pedestrians and using hand signals for indicating motorists and pedestrians your travel direction. What is the first and foremost investment for a motorcycle rider? It is essential to buy the right safety gear particularly the helmet, the gloves, the motorbike pants, the jackets, the boots etc. However, the first and foremost investment for a motorcycle rider is investing in antilock brakes. The ABS or the Antilock Braking System is today available on a broad range of motorcycle models and are a well-proven lifesaver. As per the statistics presented by the IIHS, ABS brakes are supposed to be 37 percent less probable to get involved in any fatal crash as compared to the motorcycles without it. Irrespective of your riding competence, ABS would be braking better than you at all times. An anti-skid braking system or an anti-lock braking system is actually an amazing automobile safety system that helps you in retaining steering control even during an emergency halt and it could be really effective in slippery conditions. This crucial feature is today standard on most high-end models. You could have them installed in your bike by spending just a few hundred dollars and experts believe it is surely a worthwhile investment from the perspective of safety. What is the right safety gear for a motorcycle rider? You must visit the online e-stores that specialise in motorcycle gear and buy the right safety gear. You are surely heading towards a disaster if you are wearing just a pair of jeans, a casual t-shirt, and sandals. You must invest in the right gear that would be protecting you from the flying bugs, wind chill, and loads of road rash. For total protection opt for a helmet, reinforced jacket, motorbike pants, gloves, and appropriate over-the-ankle boots or footwear. Use effective eye protection. Use goggles or a helmet visor. Wear brightly coloured or reflective gear so that you are fully visible to the other motorists on the road. What is absolutely critical to safe riding? We are asked all the time if anyone has a ride planned. While we are almost always down for a ride here at Gateway BMW, we understand that not everyone has Monday off. As such, we’d like to recommend some local groups that hold regular rides, and resources for finding fellow-minded folks. Shadow Riders are an all-brand club that organizes rides on a regular basis. Check their website for upcoming rides. Rever is a iOS and Android app that lets you plan and share rides, and offers premium content from Butler Maps. For those of you looking to ride with one or two like-minded individuals, or who may want to ride in a different style than some of the links above, log on to STLRideit and post your plans there. You are sure to find someone who is looking to twist the throttle! Buy a motorcycle jacket that has all the above important features so that riding could be a fulfilling and safe affair forever. Click Here…. NEW SCHUBERTH C4 MOTORCYCLE HELMET COMING SOON! REDEFINE YOUR STANDARDS. PASSION, NEWLY DESIGNED. -For optimum Bluetooth® and radio reception. Integrated antenna, pre-installed speakers and microphone. -Plug & play designed for the new communication system SC1. -Extra-large anti-fog lens. Wide field of vision even when the rider adopts a racing posture. The helmet is in accordance with the DOT testing standard and can therefore be used throughout USA. The Schuberth C4 is available in sizes from XS to 3XL. This conforms to head circumferences from 52 to 65 centimeters (6 5/8″ to 8 1/8″ hat sizes). The unique method for manufacturing shells used by SCHUBERTH makes for low weight combined with optimum stability. Direct Fiber Processing (DFP) is an innovation developed by SCHUBERTH. It involves an endless glass fiber being cut into pieces by a robot and being blown into a mould. This preform is baked under high pressure in a heated mold with the addition of a precisely defined quantity of resin to produce an exceptionally solid shell. The multi-part construction of the inner lining allows for outstanding force absorption, thereby enhancing safety. The internal sun visor can be extended or retracted with one hand by using the slider on the edge of the helmet. Now you can react lightning quick to sudden sun glare or shade. -Schuberth is offering a special 3 year Service Plan on new helmets purchased in North America. After registering the customer receives a certificate that can be redeemed for a non-safety related helmet inspection and adjustment within 3 years of purchase date. Just present your original purchase receipt and certificate for this free service. This service does not include any parts necessary, and all safety-related issues must be referred to Schuberth NA. -Schuberth’s highest priority is the safety of our helmets user. We believe our customers should always wear the optimum helmet, and not purchase a “cheap” replacement if their Schuberth is damaged or ruined as a result of a motorcycle accident. The Schuberth Mobility Program is a free program that offers customers the opportunity to replace their helmet with the same model for one-third of the current retail price within one year of the accident. Requirements are proof of pre-registration (online), drivers license with valid motorcycle endorsement, the police accident report, and original purchase receipt. This program applies to all helmets purchased in North America for 3 years after purchase date. -Schuberth offers a 7 year manufacturers warranty from date of manufacture, with a 5 year warranty from the date of purchase, whichever comes first. Please note that this applies only to helmets manufactured to meet the DOT standard and purchased in North America. Stretch jeans are often referred to as spandex jeans and are the hot favourites of the current generation. Stretch denim is supposed to be a new kind of denim cotton which has a slight amount of elastane which is a synthetic but stretchy fibre and is also called Lycra or Spandex. Typically, stretch jeans would be consisting of 1% to 3 % of elastane. Stretch jeans actually look pretty similar to the regular jeans. However, they provide a lot more flexibility in moving around. In this context, you must know that KEVLAR Jeans are just right for riding a motorcycle as it allows tremendous flexibility in riders’ body movements. Hence, they are really comfortable to wear while riding. Stretch jeans are usually, more form-fitting as compared to the non-stretch regular jeans. More and more modern and fashion-conscious men and women are feeling happy to include stretch jeans in their everyday wear wardrobe as these jeans are the ultimate in comfort and style. Here are some of the main reasons why everybody loves to wear stretch jeans. Stretch jeans are the best in terms of comfort and flexibility. You could now work happily in a pair of stretch jeans as it would allow maximum mobility. They have a 15 percent stretching capability and are just right for working. You could easily bend over, move around freely from side to side or bend backward with ease. Similarly, KEVLAR Jeans are best for riding as they allow maximum mobility. You could now easily and comfortably do your daily regimen of workouts wearing a pair of stretch jeans. Many of you have always been looking for functional yet stylish exercise apparel. Spandex Jeans are able to solve this issue by coming up with really soft and comfortable style of pants. You simply cannot go wrong with the latest stretch jeans whether you seem to be running on your treadmill or lifting weights or performing yoga. Stretch jeans are simply great in terms of style. They make you look chic, sophisticated, and incredibly hot. They flatter your figure. They are stretchy; hence, they hug your body to create a slimmer and trimmer look. Regular jeans are more prone to creases and wrinkles. But stretch jeans are wrinkle or crease resistant. You could wash them and wear them without even ironing and the few creases that may appear would smoothen out when the jeans get stretched and hug your figure. They certainly give you a much smarter and fitter appearance. If not properly ironed the regular jeans may look sloppy at times. ROAD TESTING A KLIM TRAVERSE! Here at Gateway BMW riding season is in full swing, and we all know what that means…Time to road-test some gear! Unfortunately, one of our crew recently departed from his motorcycle traveling at a good clip wearing a Klim Traverse, and was left with a jacket with what could be termed “aggressive venting”. The estimated road impact speed was “around 80”. Why Do You Need To Protect Your Feet While Riding A Motorcycle? Motorcycle riding could be immensely exciting and great fun but it is certainly not free from risks. Motorcycle riders are pretty vulnerable to accidents and other road-related hazards. You must follow the best safety practices so that you are able to prevent mishaps or at least, protect yourself from serious injuries in case of an accident. It is mandatory to wear your motorcycle safety gear whenever you are riding your motorcycle. We are quite aware of safety equipment such as spine protectors, jackets, helmets, and we religiously wear them. But you should not forget about the safety of your feet. 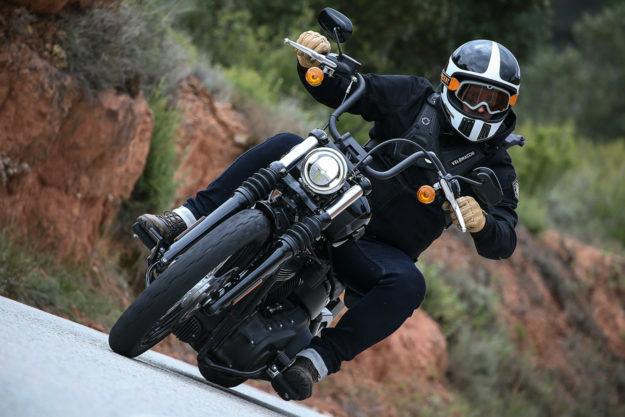 Here are a few solid reasons why you must protect your feet by wearing the right motorcycle gear such as a pair of robust motorcycle riding boots. While riding the motorbike, your feet are always exposed. You may fall down while riding, hence, your feet are vulnerable to impacts. So you must always wear protective gear such as a pair of boots that are fortified with steel and suitably structured for protecting the bones present in your feet from sudden object impact and from the extreme weight. If you religiously wear the appropriate protective boots, you could be responsible for remarkably cutting down the risks of getting injured in case of a motorcycle crash. Studies have revealed that motorcyclists wearing protective boots would encounter 50 percent fewer chances of an open wound injury in comparison to those who don’t. So, always wear the right motorcycle gear for your utmost safety. When your motorbike comes to a halt, you need to balance the bike’s weight along with yours which is just not an easy affair. You would be requiring adequate ankle support for allowing you to do this safely. Moreover, if you are involved in an accident, both your feet would be subjected to contouring and twisting. You must wear the right motorcycle boots for complete protection. Time and again, it has been proved beyond doubt that casual shoes or tennis shoes are of no use and would be slipping off your feet in case of an accident. 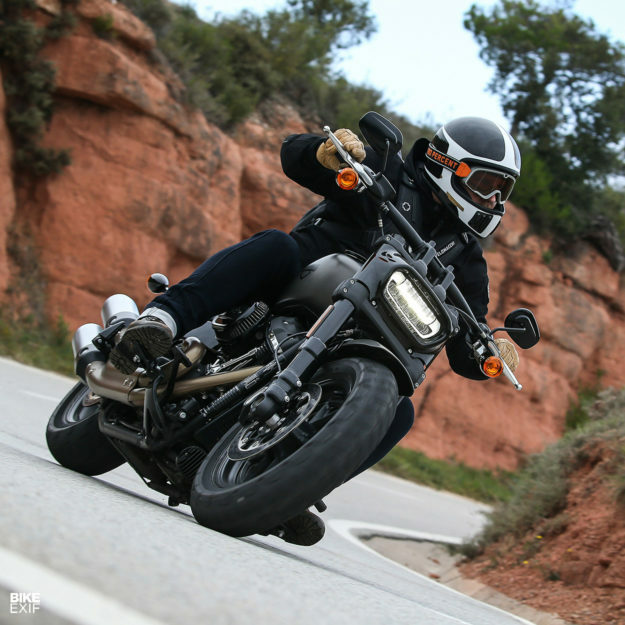 When you lose control on your motorbike, there is a natural tendency to stabilize yourself by sticking out your feet and touching the ground. This could be done successfully if you are wearing the right shoes that offer adequate traction for gripping the ground. A pair of motorcycle boots is just right for retaining complete control over any untoward situation during the wet rainy season. Aussie motorcycle clothing brand, RhinoLeather, recently conducted a survey of their customers to understand what is that they love about riding their motorcycle. Was it the sheer thrill of it, the chance to break away from the humdrum of life, or was it the camaraderie that it promised? The response was overwhelming but the one common thread through all the replies was that riding, more than any other passion in life, offered connection between mates, something rarely found elsewhere in life. It’s just not the leather jacket, the tattoos or the wind breezing through your hair (though these things do matter), but the fact that it gives the biker companionship of fellow riders which coincidentally was in line with RhinoLeather’s own philosophy – Love The Life, Love the Mateship. RhinoLeather said the results had prompted them to launch #LETSRIDE hashtag so motorcycle riders can share their stories of the open road amongst each other. What follows are some of the responses to the “I Ride, because….” campaign. Keep your heads up and eyes on the road. These words are what we often hear when we ride motorcycles or drive any other vehicle for that matter. Safety is and should be the number one priority. This is the primary reason why Dave Vout, managing director of Motorcycle Information System Technologies (MIST), created Bike HUD, an innovative heads up display connected to a biker’s helmet. 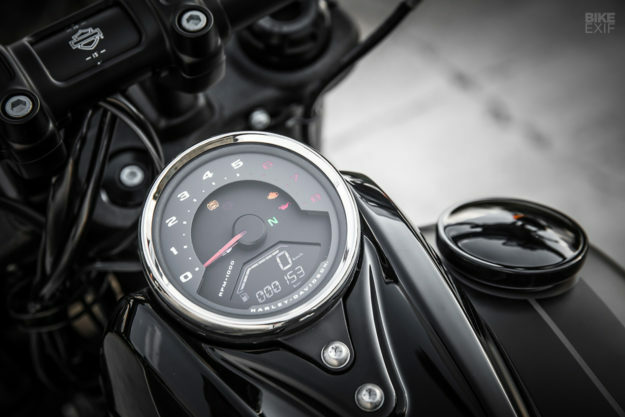 It displays a motorcycle’s speed, gear, time and engine revs on a mini-monitor dashboard which the driver can see without leaving their eyes on the road. It also features a GPS system and temperature sensor. This bike technology is customised to fit the needs of every rider. It comes with an on-board computer unit, a handlebar mounted case for the rider to scroll and navigate through different information and a heads-up display unit. Here is a video clip of how BikeHUD works on a rider’s view. As you can see, the colors change depending on the rider’s speed. It is white when the speed is at 31mph or below and becomes blue when it reaches above 31mph. This provides convenience to motorists as they will be able to see the change in color out of the corner of their eye, without having to look down at the speedometer in front of them. This technology may not seem important to motorbike riders as they use open face helmets and they do not join in races or tracks. Nevertheless, motorbike riders still has to think of the security Bike HUD provides. It prevents you from irritating distractions that comes with motorbike riding. You never have to keep your eyes off the road to check on your speedometer since you can see it out of the corner of your eye. Bike HUD also comes with a GPS system and various route options that lets you navigate more easily. Let us know what you think, Would you consider buying this? This is one technology many motorcycle riders should consider for their safety and convenience. It seems like can be a technology investment worth the money. This event includes a charity auction, raffles, tattoo comp, best stock / custom bike, dinner and music by the Spin Gents. The run starts at Muswellbrook McDonalds and ends at Railway Hotel Muswellbrook. The event is organized by Run Beyond Survival, a non-profit foundation that endeavors to assist those with chronic illness to live a full and fruitful like and to support research, therapy and treatment of those illnesses. The foundation has strived to interact with its peers, neighbouring charities and local community in an amicable manner to support locals in need of assistance and to raise awareness. Enjoy a great scenic ride on the NSW South Coast with other motorcycle drivers in this charity event and win cash prizes. An after-party will be held with lots of great food and live music at Tuross Head Country Club. Camping is also available. Check out the website for more details. This charity event is organized to raise money for Tuross Head Marine Rescue. For the past 20 years, Harry has worked with different Harley-Davidson bikes. Originally from Germany, he is a qualified “sidewinder centre” and has trained with Harley-Davidson Company. 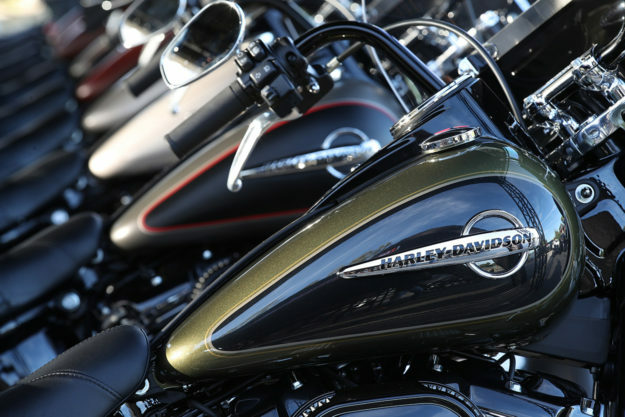 The event dubbed as Harry’s Custom Bikework showcases various Harley Davidson bikes customised by Harry himself. Different classes including Modern Chopper, Oldschool Chopper, Modern Bobber, Oldschool Bobber, Classic, Paint, Ratbike, Daily Rider and Encouragement Award will be held in the event. You can check out his website www.harryscustom.com.au or his Facebook page for more information. This year will be the event’s 25th year and it will showcase lots of classic and custom bikes and cars for motor enthusiasts. There will be live music, trade shows and food. It will be held at the Community Club car park, Sturt Reserve, Murray Bridge. You may contact 0412-698-049 or email graaf@intermode.on.ne for more information. The event, to be held at Wooroolin Sports Grounds, will feature Australia’s ultimate ZZ Top tribute show. This will be a fun event for the whole family with free camping and raffle prizes. The proceeds will go to the High Court calling against the Vicious Lawlessnes Association Disestablishment (VLAD) Act & Anti-Association Laws introduced to Queensland last year. Different groups are sponsoring the event, including the United Motorcycle Council of Queensland. Check for more information and ticket reservation. Majority of the time, riders gain experience riding in the rain without choice. With notorious Sydney “four-seasons-in-one-day” weather, you can often leave for a ride with the sun out and 24°C being displayed on your thermometer, but then cometh the afternoon, cometh the clouds, and you’re stuck in a thunderstorm and forced to ride in the rain. Those who get used to it will continue to ride, no matter the weather and will ride on into the storm clouds with a grin on their face. However, those who are apprehensive and contemplating venturing into the grey void, here are a five tips and hazards you should look out for no matter your age or experience. One of the most prevalent hazards are painted lines, and examples of this can be seen in zebra crossings and approaches to school zones. If you are forced to turn on these lines at an angle, slow down more so than you would and try and make this turn as upright as possible, rather than leaning the bike in. Another dangerous surface to be weary of is slick concrete, prevalent in commercial and resident car parks. As mentioned in the point above, ensure all movements are made as upright as possible and remember to slow down! Metal plates and covers in the road are your worst enemy in the rain. Keep an eye out for them as you are riding and try and stay straight up when travelling over them. Avoid them at all costs, but if you are forced to make a turn over these surfaces, once again remember the slow and straight methodology. Oil is everywhere on the road and is a fact of riding. Nothing can be done about it, however you have the power to control when to ride. A first rain on a dry road is very dangerous, as the mud and oil on the road combine with water to create a slippery layer. If you can, try to avoid riding in the first half hour and stop and have a coffee before venturing out again. Gravel can be one of the trickiest hazards for motorcyclists to navigate, and particularly tricky during cornering. As it happens, majority of the time this gravel on the road is prevalent on winding roads, which are a bikers bread and butter. Accidents involving gravel are more often than not attributed to speed as well as riders who don’t have the required experience to handle the situation. Thankfully this winter hasn’t been too wet and dreary, and here in Sydney we’ve been blessed with more sun that we would usually expect. The cold however hasn’t gone anywhere, and being a typical winter we can expect nothing to change on that front. Knowing what to wear and learning ways to get rid of that chill when riding change your ride from a cold unenjoyable experience to a pleasant relaxing ride. With new materials and apparel constantly being released, you no longer have to be afraid of winter and can now ride comfortably all year round. Ensure your gear is wind proof, as the quickest way to lose body heat is through jackets that allow wind to enter and let the heat escape. If your jacket is allowing this to happen, purchase a jacket that doesn’t so that you don’t have to ride in the chill during cold days and nights. Always remember to strap up all vents and openings in your jackets and pants. There’s nothing worse than being in the middle of the road and realising you’ve left a vent open! Check out some of our waterproof textile jackets here. Cotton while Riding – Australia says NO. Remember that cotton and riding go together like Justin Bieber and Harleys, it just doesn’t work. So when you see rain clouds coming in thick, ditch the cotton quick. Nothing is worse than riding in the rain and having soggy cotton sticking to your body like a leech, so be sure to leave all cotton wear at home before you head out. Obviously if you’ve left your undergarments at home, that doesn’t mean you’re appropriately dressed to get on a bike and ride out! You should purchase a set of synthetic undergarments which are able to worn under your gear. Examples of these base layers are compression wear that is usually worn for sports, such as soccer, footy and AFL. However, in the case of long rides and staying warm this is a very viable option and definitely something to look in to! Keeping your core warm is crucial in the fight against winter and staying warm for long periods of time. Thus compression gear is a great way of doing this, as it keeps you warm while also letting your skin breathe. Eating ice-cream will warm me up?